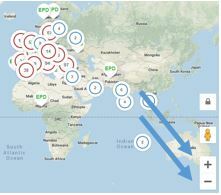 Click and unlock to navigate the map to discover all construction materials in the World with EPD information. Use these buttons to zoom in and out on the map. 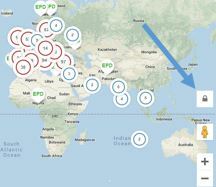 Type any keyword to find any construction products with EPD, then click the green search button. 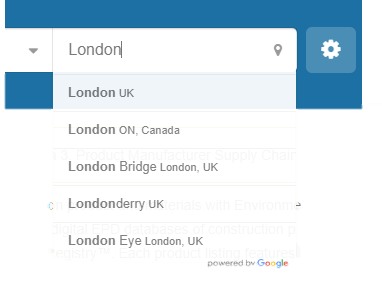 Alternatively, you can browse via pre-defined categories available as drop-down list. You can also search by specific location and define the distance from that location. Setting button will turn into green and slider is available in km. This is especially useful to find materials within the locality of your project site. This gives you the opportunity to obtain materials credits in LEED for locally sourced materials. Set this to 160 km (100 miles) from your project site. Then Click to Submit. Within a week, your EPD will be registered and you will be notified by e-mail. If you do not receive any e-mail within 1 week, please contact us.